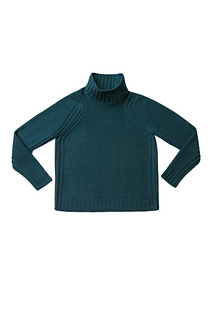 The mock turtleneck gets a futuristic lift from racing stripes of graphic double rib that delineate the sides and underarms and then slalom around the shoulders. 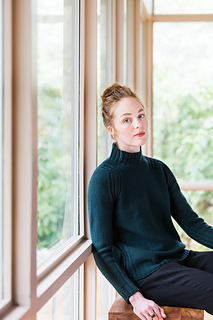 Knit in Arbor, the base fabric of reverse stockinette throws the ribbing into high relief, and tubular edges create a durable and professional finish. 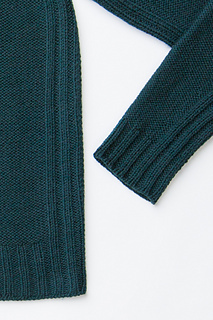 When choosing a size, keep in mind that the sleeve caps have an unusual construction that makes the cross-back measurement more important than the bust dimension; you may need to knit a size larger than usual. 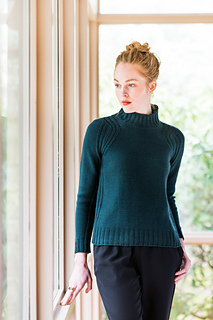 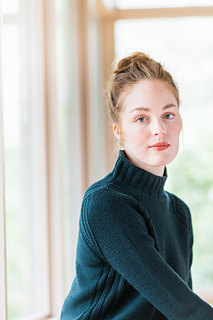 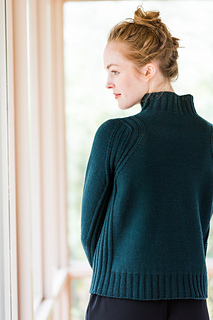 The shoulders are designed to fit closely while the body of the sweater hangs loose and straight.